Portland-based jazz singer and songwriter Jimmie Herrod performs with a sextet of members of the Portland Jazz Composers Ensemble. 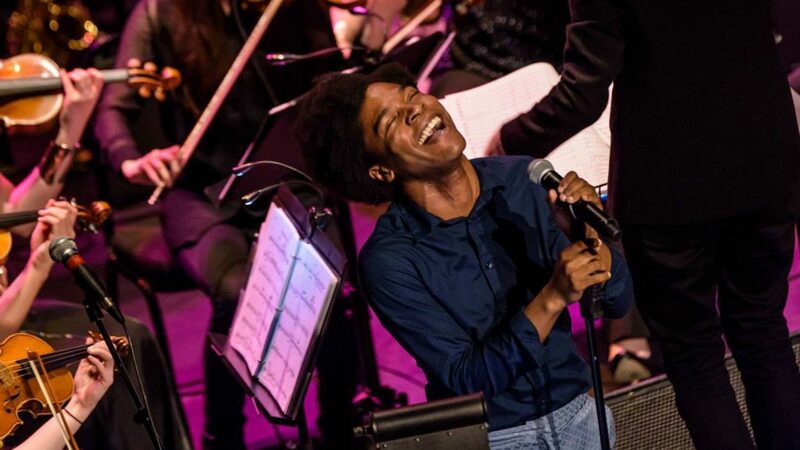 Herrod, who sings with Pink Martini and many others, will perform a song he has composed with inspiration from the words of Billie Holiday, as well as new arrangements of songs made famous or composed by Billie Holiday by some of the city’s most talented composers, Clay Giberson, Kerry Politzer, and Alex Koehler. This presentation goes beyond music. Imagine a live band scoring an episode of your favorite storytelling podcast like This American Life. Douglas Detrick, Executive Director of the PJCE and producer and host of its podcast Beyond Category, has selected and edited a collection of excerpts from interviews that Holiday did during her career, and will interview Jimmie and the arrangers about the process of reinterpreting Billie Holiday’s music for today’s audiences. The audience will come away from the concert knowing more about this iconic artist, broadening their appreciation for the Portland Center Stage production “Lady Day at the Emerson Bar and Grill,” which runs May 26 to July 1. Join us for a reception in the Portland Center Stage atrium at 6 pm, and for the concert which begins a 7 pm. Tickets are just $5 and are available here. Use the discount code “PJCE” for $10 off your tickets for “Lady Day at Emerson’s Bar and Grill” here!